William Dunlop will ride a Kawasaki ZX-10R in the Superstock class prepared by MSS Performance. William Dunlop has finalised his line-up of machinery for 2016 after agreeing a deal to ride a new Kawasaki ZX-10R for Nick Morgan’s MSS Performance outfit. Dunlop, who switched to Ulsterman Chris Dowd’s CD Racing team for 2016 to ride a top-spec Yamaha YZF-R1 Superbike and an R6 Supersport machine prepared by respected former Yamaha WSBK engineer Marcus Eschenbacher, is set to compete in selected rounds of the National Superstock 1000 Championship next season in addition to his commitments at the international road race meetings. 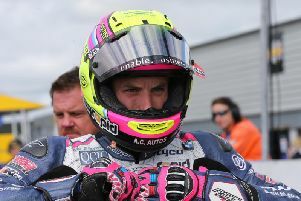 Dunlop, who won the Irish National Superbike and Supersport road racing crowns for the first time this season, said: “If I’m really honest I wasn’t too sure about Superstock but when I heard we had the option of running with Nick and understood the whole package, I became really positive. “I’m excited to be doing it properly with testing and some BSB rounds, which will mean I’ll be sharp for the TT. Chris (Dowd) sorted the deal and as we both know, Nick and his guys have fantastic knowledge and data on the ZX-10R in this spec. “It’s been a long time since I’ve been in green and that was an old MSS ZX-6R, which was great bike,” added the 30-year-old Ballymoney man.